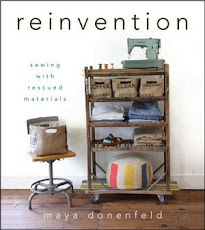 Buttons are so much more than just little " fasteners" of clothing. As any button collector will tell you, they are rich in color, materials and style. The truly old ones are like miniature antiques and speak of art, traditions, craftsmanship and family lineage. Oh, if buttons could talk! Can you imagine the stories of adventure and long forgotten times they might tell... from the old brass buttons on a soldier's uniform to the highly prized jet buttons which decorated the black silk dresses of the Victorian age. Or maybe they would tell a little bit of our own tale: our grandmother's buttons from her wedding dress or even the little plastic bunny button that fastened a favorite purple jumper in the 1970's (ahem, that would be mine). 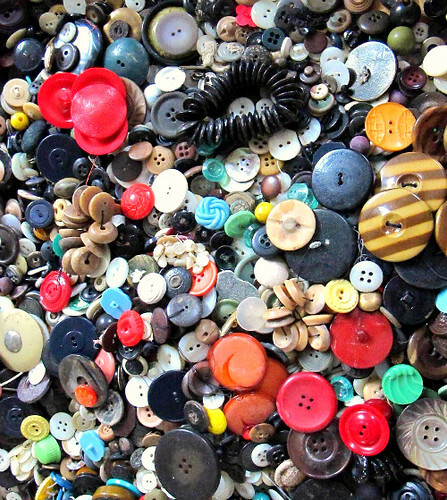 When I tweeted that my children and I were sorting through my mother's button collection, the response was universal... "I remember doing that as a child!" Her collection is quite vast now, compared to the little basket I upturned onto the floor as a girl. But I still found my old favorites shining through the masses as if they glowed! My daughter actually found those bunnies! Trays are very useful for spreading out bunches of buttons and still keeping them contained. In our case, they also kept them from slipping through the cracks of the front porch. 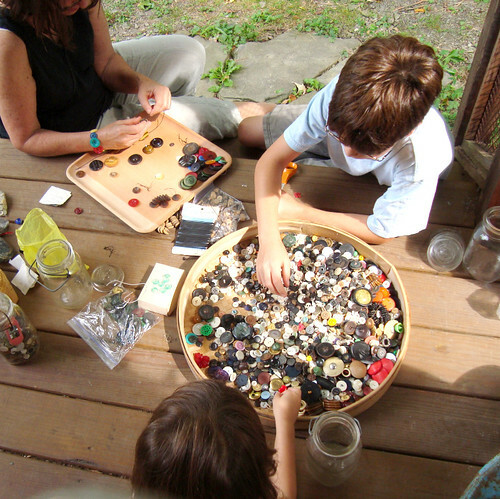 Sorting, counting, crafting... there are endless ways to enjoy buttons together. I always love to check out Lil Fish Sudios to see what Lisa has been up to on her button mondays. Some day soon we'll make Martha's button stamps. Google button crafts, and you'll find a plethora of ideas. And of course, Amazon has dozens of button books. 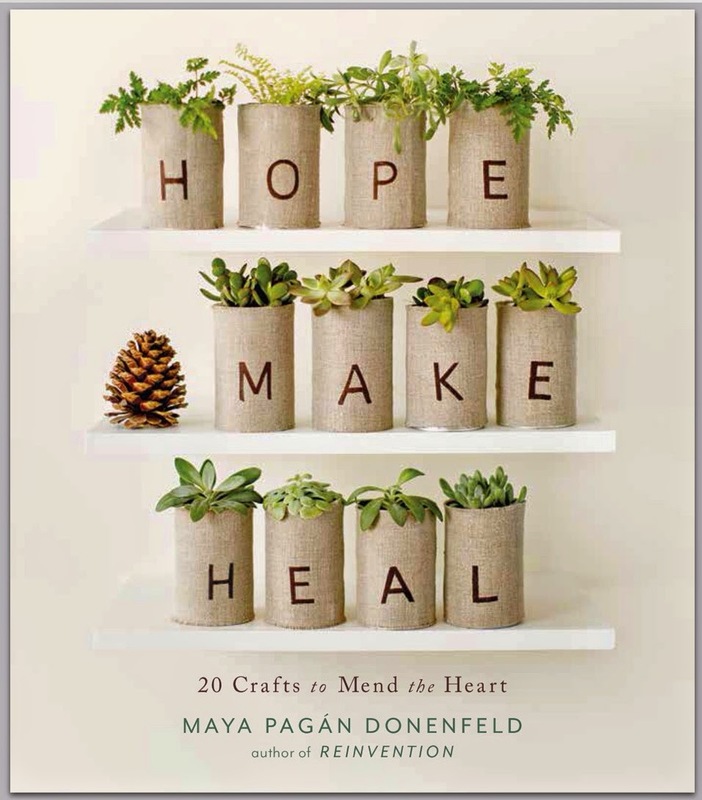 So what did we do with all that inspiration? 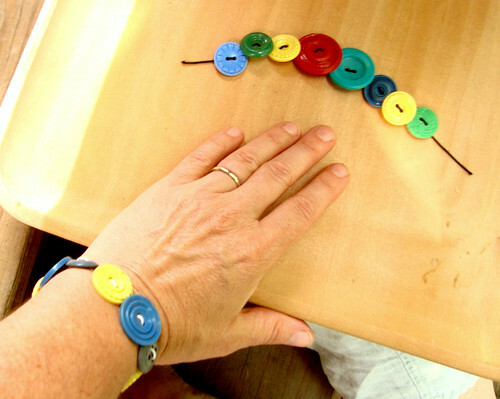 Easy, fun, instant-pleasure kind of button crafting! After arranging buttons of choice in a pattern, string them on an elastic cord by "poking up through the pretty side and the down through the pretty side", as chanted by my girl throughout each bracelet she made. Tie it on your wrist. Petting a sleepy cat is optional. We also created some interchangeable hair pins. In the past, I made these more permanent by sewing a button to the end of a clip: very sweet and simple. But on this day we tried using buttons with shanks, instead of holes, for immediate success. Just slip a bobby pin through the shank and voila! Oh, look there is that bunny! Can you guess who might like to wear this little one? Who doesn't love an instant hair accessory: a lovely bit of vintage charm to tie back tresses? Each button will adhere to the pin differently, depending on the shank. Some will be loose, others snug... but as soon as they slide onto your hair they are fixed place like a little bit of magic. We think the center photo looks a little bit like a cluster of lollipops! 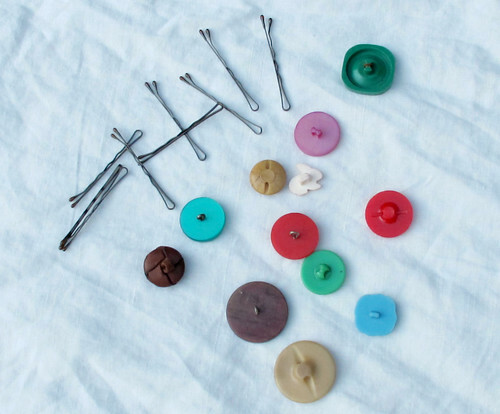 Look for button collections at thrift stores, flea markets and garage sales. Do you collect buttons, also? Did your mother? I'd love to hear some of your button stories. Love your collection of buttons!! I seem to find them at every thrift store I go to and think I need just one more jar LOL! I just love buttons. I love checking out the Op shops to see what they have. I really love the idea of making the hair clips with buttons and bobby pin. I think this is a great idea. I love buttons too. I started my collection with a jar of random buttons from a garage sale. More recently, I inherited my grandmother's button collection. She passed away at the age of 99 and a half. It was quite a collection! Have you seen the book "The Button Box," by Margarette S. Reid and Sarah Chamerlain (illustrator)? It is essential for any button collector! My grandmother lived across the street from the author when I was a child and I got to see part of her collection. So much fun! A 99 1/2 year old grandma's button collection! wow! Katie, I just put your book on our library list! I'm sure we'll love it. How cool that you got to see the author's collection. yes indeedy i am a button lover from waaaay back...i have the very same memories of button viewing on my grandmother's front porch...and i inherited her jars and have added to them through the years...in addition, a friend who worked for a button company gave me BOXES of colored buttons just perfect for crafts! I have a button obsession, can you ever have enough? Never mind too many. LOL. My grandmother kept her buttons in a jar, I used to love going through them as a kid. My son loves them so much that I gave him a box full of buttons for his fifth birthday a couple of weeks ago..
About 20 years ago I worked in an old "drapery and haberdashery" shop, one of the last of its kind. Sadly, it is gone now, but I have most of the box of buttons that were collected over the 50 years in business! They are now kept in a jar, and my small children and every child who comes into the house looks to play with them!! I was really hoping to hear this kinds of stories!! Love them! Button collectors unite! What the heck is it about buttons? They're just so universally appealing. Tiny little practical artworks. Love! Thanks so much for the shout-out, friend. Love the bobbie idea. Just think of the memories your children will grow old with! I too remember my grandmother's button tin. I am currently using buttons in little pocket books I am sewing (can be seen on my blog...am even selling some)...all have buttons to close with a string to hold them closed. So sweet. adore that simple diy with the hairclips, going to make them too with my little princes. thanks for sharing! What a great ideas! I just love buttons! Now I'm looking for some stamps with buttons! I would love to have some for my hobby! :-) I have a small collection of buttons and I use them for scrapbooking! So when I have some time I'm looking in small shops for nice buttons but your collection ist just sensational!!! I love buttons and I am jealous of your stash. My Grandmother used to clean the house of an elderly man - he was once a well known actor in silent films. Each film or theatre production he was in, he would snip a couple of buttons from the costumes. When he died, he left his entire collection to my Grandmother, and she in turn left it to me. They are my most prized possesion! Not only did I just "relieve" my mother of her old box of buttons, but I also just started using bobby pins for the first time in years! This is a perfectly timed post for me. Thanks! Oh how I love button sorting! Thanks for the fun craft ideas! And as always, your photographs are beautiful. You have such great ideas! I just found a vintage sewing basket full of all sorts of old buttons. I have had a blast sorting them by colors and shapes :) I'm using some of them for the projects I am working on, but now I see so many more possibilities! Thanks! Amazing and easy to do, congratulations! Kisses from Spain! I've gone nuts on buttons and found your blog today. They are a time waster though haha. Love the bracelets and aren't they a great way to amuse children. Great to see there are more of us who are crazy about buttons! My grandma was collecting buttos and I used to go through her 'traesure box' every time I went to visit.